Note that the above is a 'staged shot' ie the machine motor stopped for illustrative purposes only. The blade guides on my Startrite 352 bandsaw could not be excused any longer, likewise the replaced thrust rods to take cutting pressure were needing to be re-ground to flat, merely rods of hardened steel I made say twenty years ago to replace the beyond hope originals. The machine itself is a good one, no qualms, in fact on a recently viewed youtube its the same machine that Purdeys use to profile their walnut gun stocks, but once I got the side blocks out there was no option but to regrind. I use the Bridgeport vertical mill for this, an aloxite cup wheel permanently mounted on its own arbor solves lots of proplems, can be rigged for tool and cutter work too. Advancing a thou at a time (ground dry) soon cleaned it up to flat again. Above is before I break the sharp edge (ie deburr) the edges on a fine aloxite wheel. Then I bought my (used) bandsaw DeWALT 876, I found that previous owner misplaced those side blocks so blade teeth made rather big "furrows" in them. 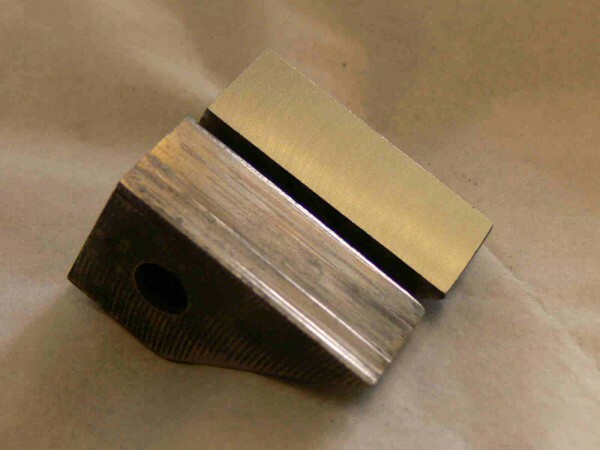 I also grinded them with my Tormek T7 sharpener (with the flat surface of disk), that took a lot of time because side blocks made of hard alloy. May be an hour or more. I've heard that bearings are better than side blocks, though over say that bearings are not suitable for work with softwood like pine. Yes, I probably should go for ball race guides, but it serves well enough for the simple straight line cutting thats needed of it. In my opinion its the steel rods that take the thrust that I would modify/ change to some form of lower friction rotating assembly. Thing is whatever I devise how long will it last / longevity ? 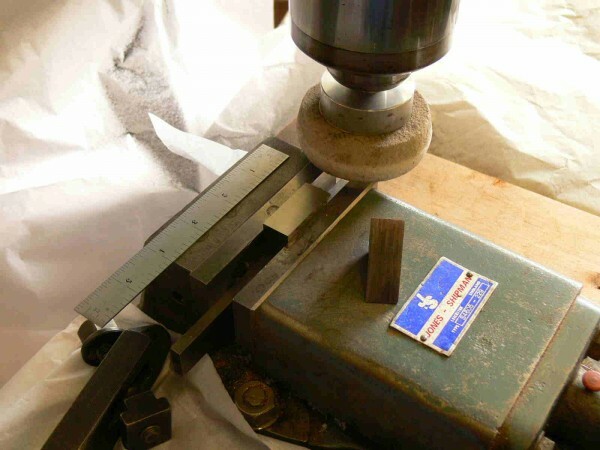 If you are not working full-time at bandsawing then properly adjusted solid blocks are quite feasible, just make sure to keep the teeth off them.